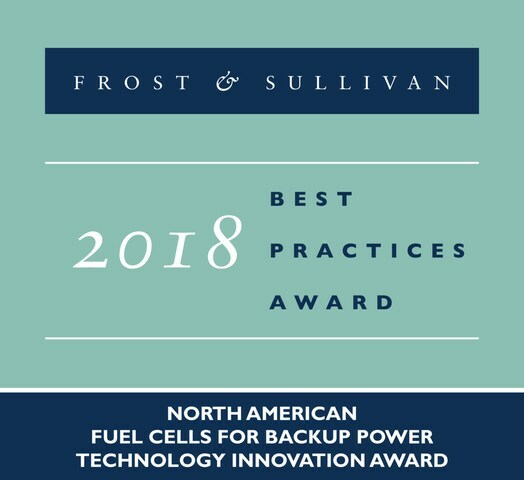 SANTA CLARA, California, Nov. 1, 2018 /PRNewswire/ -- Based on its recent analysis of the North American market for backup power fuel cells, Frost & Sullivan recognizes Altergy Systems (Altergy) with the 2018 North American New Product Innovation Award for its Freedom Power fuel cell technology. The truly advanced Freedom Power technology combined with the benefits of its allied fuel cell products enable reduced capital requirements, greater durability, lightweight construction, fast start-up, and high modularity. These aspects have endowed the solution with a clear competitive advantage over traditional backup power technologies such as batteries and diesel generators. While conventionally designed fuel cells employ fragile, expensive components, Altergy's Freedom Power technology uses rugged, affordable, and everyday materials. To facilitate the commercial-scale production of these groundbreaking fuel cells, Altergy has constructed the world's first fully automatic robotic fuel cell fabrication plant. This plant ensures higher volume output and lower cost per unit performance than fuel cells that are manually assembled. The technology allows Altergy to manufacture one fuel cell every 30 seconds and the complete fuel cell engine in minutes. "Altergy develops polymer electrolyte membrane (PEM) fuel cells, a grid-free and battery-free power system that can provide long-running, primary, or backup power for various industries. These modern fuel cells are robust and generate reliable, long-running power anywhere, including hard-to-access locations or sites that are subject to harsh or inclement weather," said Vijay Wilfred, Industry Analyst. "Altergy's Freedom Power technology utilizes flex-plates to maximize the electrical contacts, reducing the need for high-precision machine work. The company's patented design decreases critical component costs by more than 80 percent, which in turn decreases the capital expenditure on its fuel cells." Additionally, Altergy has eliminated the use of gaskets by bonding membranes directly to plates within the cell stack. Their unique method of establishing contact between the bipolar plate and membrane electrode assembly enables superior current collection, scalability, and ease of manufacture. Furthermore, the technology is designed to use stainless steel to fabricate the fuel cell components, replacing the brittle graphite-based components used in conventional fuel cells. Because Freedom Power technology allows Altergy to produce lightweight fuel cells with a compact footprint, they can be safely installed on rooftops and tight spaces where batteries and diesel generators cannot be used. Additionally, the novel design ensures extremely quiet fuel cell power system operation because there are no moving parts or internal combustion. "Altergy serves customers across verticals such as telecommunications, public safety, military, traffic signaling, and other mission-critical networks. Its fuel cells can also be used for energy demand management in diverse industries by providing power during peak periods," noted Wilfred "Overall, Altergy's Freedom Power technology's ability to provide an uninterrupted and clean source of emergency backup power through fuel cells at a low total cost of ownership makes it a truly visionary product and positions it for high growth in the future." Altergy has revolutionized fuel cell design, and is the first and only company of its kind to cost-effectively mass produce industrial-strength fuel cells. As the leader in telecommunication backup power, Altergy is now addressing critical power needs in additional industries to include: Cable, Public Safety and Military and Homeland Security. As the modern, clean and reliable power source for now and the future, Altergy's unique Freedom Powerâ„¢ products and solutions provide freedom from batteries, generators, pollution, noise and the grid. Please visit altergy.com for more information.